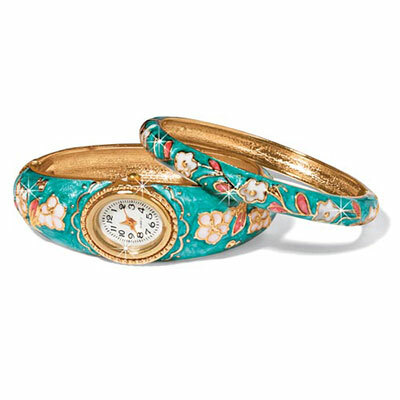 The intricate look of cloisonné with all the details!. Delicate white flowers and pink leaves are outlined in gold-tone on soft teal green enamel. Wear The Dogwood Watch and Bracelet Set together or one-by-one. Quartz watch bangle, 2¾"d; bangle bracelet, 3" dia. Hurry! Quantities are limited! I was concerned that it might be too big for my wrist but the oval shape of the watch keeps it in place. The accompanying bangle really adds to the drama of the piece.